Planning on visiting us here at Sculptured Rocks Farm. Take Route 93 to exit 23, turn onto Route 104 West, follow to traffic light, continue straight onto Route 3A north, follow to north end of Newfound Lake, turn left onto North Shore Road, follow into village of Hebron, bear right after Hebron Village Store, continue on this road following signs to Sculptured Rocks State Park, second house on the left after Sculptured Rocks State Park. When coming from the west, take Route 91 to Route 89. Go south on 89 to Route 4 east. 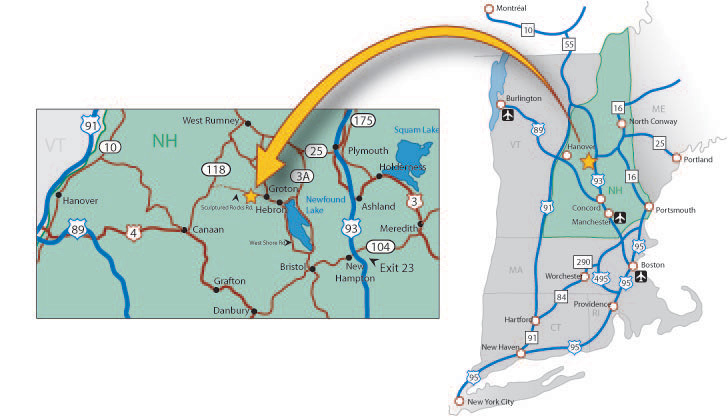 Follow route 4 to Canaan and turn left on 118. Take 118 to Groton. Turn right onto North Groton Rd. (don't be tempted to turn onto the earlier Province Rd. that links up with Sculptured Rocks Rd. It is an unmaintained road and has washouts that are impassable). Follow North Groton Rd. to the village of Groton. Turn right onto Sculptured Rocks Rd also following signs to Sculptured Rocks State Park. The Farm is the second house on the left after Sculptured Rocks State Park. Join us for the most relaxing stay of your life.